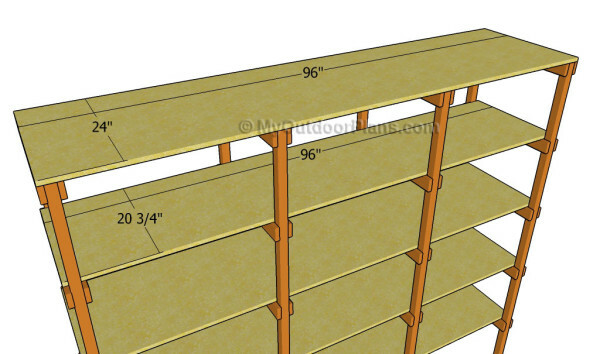 This step by step diy project is about how to build storage shelves. 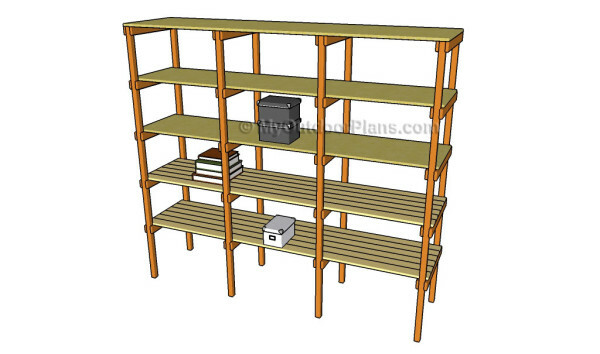 If you want to create additional storage space to your home, you should consider building wooden storage shelves. 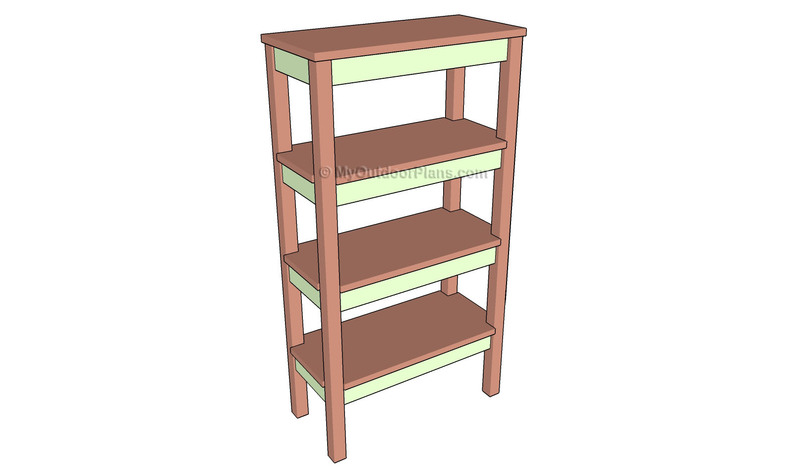 This article features step by step instructions about building sturdy and simple storage shelves. Don’t forget to adjust the size and the design of the storage shelves to suit your needs and tastes. Build the brackets with great attention, making sure all the components are level and secured properly. Select the materials with great care and attention. Make sure the lumber is perfectly straight and in a good condition, otherwise the end result might not raise up to your expectations. Check if the corners are right-angled after attaching each component into place. 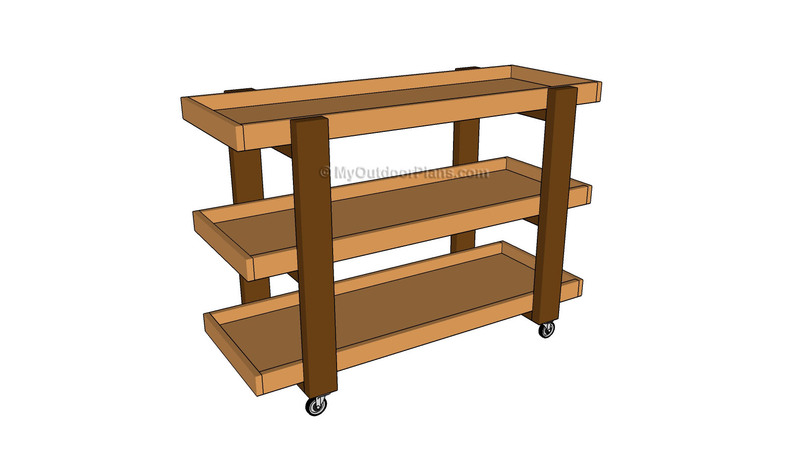 The first step of the woodworking project is to build the supports for the storage shelves. 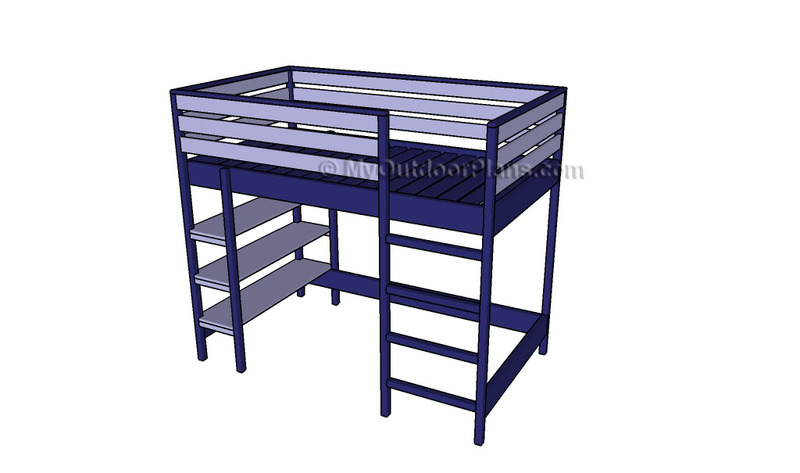 In order to get the job done in a professional manner, we recommend you to use 2×2 lumber for the legs and 1×3 slats for the braces. Lay the legs on a level surface and attach the supports, making sure the corners are square and equally-spaced. Drill pilot holes through the slats and insert 1 1/4″ screws into the legs. 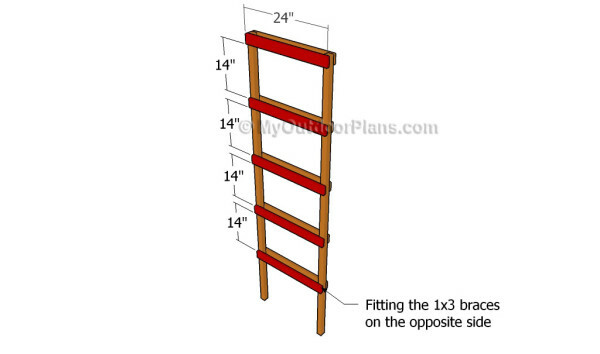 Continue the woodworking project by attaching the braces over the opposite side of the supports. Work with attention and drill pilot holes before inserting the screws, to prevent the wood from splitting. Use a rectangular square to make sure the corners are square. Leave no gasp between the components. 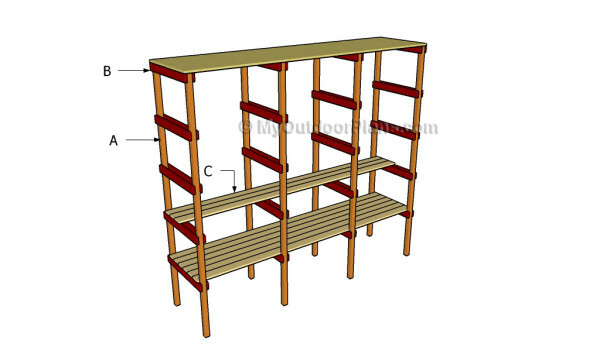 After building the four supports for the storage shelves, we recommend you to assemble the structure properly. 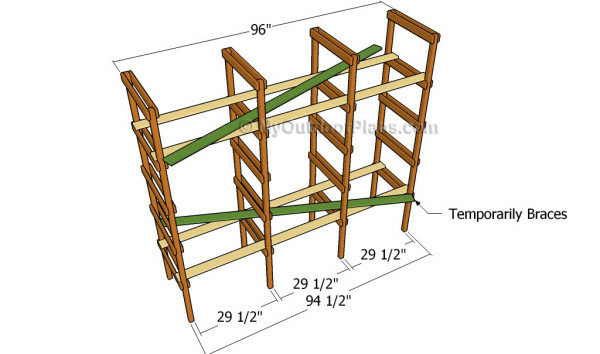 As you can easily notice in the diagram, you could use 2×4 slats to build the shelves or 3/4″ plywood sheets. In order to lock the components together properly, we recommend you to plumb the supports with a spirit level. Afterwards, we recommend you to fit the diagonal temporarily braces into place. 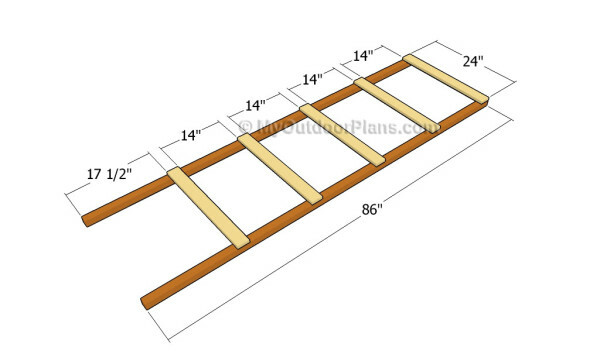 Drill pilot holes through the 1×4 or 2×4″ slats and secure them into place by suing 1 1/4″ or 2 1/2″ screws. Align the components at both ends and leave no gaps between the components. Alternatively, you could attach 3/4″ plywood sheets over the structure, in order to save time and money. Drill pilot holes through the plywood sheets and insert 1 1/4″ screws into the supports. Make sure the corners are right-angled after attaching each component into place. Last but not least, you should take care of the finishing touches. Therefore, you need to fill the cracks with wood putty and let it dry out for several hours. Afterwards, sand the wooden surfaces with 120-grit sandpaper and vacuum the residues thoroughly. Top Tip: Protect the wooden components from wood decay by applying several coats of stain or paint. This article was about how to build storage shelves. If you want to see more outdoor plans, we recommend you to check out the rest of our projects.